- Phil volunteering to be the PTA treasurer. 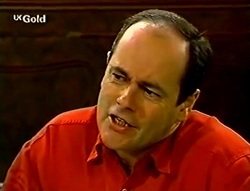 - Jo telling Debbie that she'll invest – then revealing that Phil gave her the advice. - Toadie knocking Susan's vase for six. Debbie and Phil's argument can be heard before they arrive in the house. Helen asks what's going on and Debbie says that Phil told her one thing and Jo another. Phil defends himself by saying they were talking generalities but Deb isn't having any of it. After Debbie's stormed out Helen calls him into the kitchen. She tells him that he's giving his daughter a hard time over this but he sees it as trying to teach her something about business. He also thinks he has a duty to Jo to tell her what he knows about the Coffee Shop. HELEN: What? That hard work and planning are needed? Why isn't Debbie up to that? Phil says that if they want to jump in, feet first, then they should go right ahead. But when it all goes wrong he doesn't want to hear a word from them. PHIL: Now if you'll excuse me, I have a PTA meeting to get to. Lance and Toadie are trying to glue the vase back together. TOADIE: If we can't glue this back together we are dead – it belonged to Susan's mother and she's dead – do you know what it means to a woman when their mother's dead? LANCE: You're right, we're dead. TOADIE: Hang on, we'll move the furniture around. LANCE: What do you mean, move the furniture around? TOADIE: It's a distraction. They'll get such a shock from the furniture they won't notice the vase is gone. LANCE: So they make us put the furniture back and then they notice the vase is gone. Phil's running late and Susan wants to give him a few more minutes. Ruth wonders how he got involved in the first place – does Susan have something on him? Oh the ways my mind took that comment! Susan replies that it's more like Ruth shamed him into it; once he heard she was doing her bit he jumped at the chance. Just like Susan's shamed Karl into coming. After a bit of deliberation Susan calls him over, rescuing him from the guys in the corner. KARL: Ailments! As soon as they find out you're a doctor they develop a terminal illness, right on the spot! How are you, Ruth? Phil finally arrives and the meeting can begin. Lance and Toadie have finished their rearrangement – Toadie's plan is "they walk in, freak out, don't notice the vase is gone". LANCE: They'll tell us off for putting the room like this. TOADIE: Wrong, they're old, their brains work slowly. It'll take 'em ages to work out what's going on. Toadie gives him all the money he has and tells him to go get some from Ruth and then go buy a replacement vase. It doesn't have to be identical, just close enough to pass muster. Ruth is trying to lead the meeting but Phil and Karl are busy holding their own conversation like kids at the back of the classroom. Ruth finally interrupts and gets the boys' undivided attention. RUTH: We were wondering what funds were available to buy some new gym equipment. PHIL: That's easy – there's none. Lance bursts in and asks to have a quick word. Once she's gone the boys get back to their conversation! Lance asks to borrow some money for some stuff Toadie needs, and distracted Ruth says there's some in her purse. I should distract my parents more often. Ruth returns to the meeting and is far from happy at having to break up the private conversation in the corner. Make 'em stand outside the Principal's office. Ruth asks him to comment on the topic of further purchases and Phil reiterates that they can't afford new gym equipment. Ruth says they were also talking about new multimedia computers. PHIL: If we can't afford a gym mat, doesn't that tell you something about multimedia computers? It quickly descends into a heated argument between Ruth and Phil, Susan watching both of them having a verbal tennis match across the room. Ruth takes the first point in dismissing his negativity, Phil draws level by saying she's not seen the books. 30-15 to Ruth as she says that's his job. 30-30 as Phil agrees with her, taking the wind out of her argument. Umpire Susan suggests they think on it and continue the discussion at the next meeting, but Phil serves a volley in stating that it is his job to be honest, not build false hopes (30-45). Ruth's biting reply is that if the Treasurer's job is to be tight fisted and mean they've found themselves a terrific one. Phil gets up and all but throws the books at Ruth saying he doesn't need to be spoken to like a child and she can do it herself. Phil storms off, Karl in hot pursuit. Phil's furious as how he was spoken to but Karl points out he was hardly Mr Warm and Fuzzy himself. As they stop outside number 28, Toadie runs up to them, asking where they're off to. Karl immediately wants to know why. Toadie's excuse? Wants to know if they'd care to join him down at the Coffee Shop, indulging in a few hands of poker. He could do with the cash. Karl decides he'd rather not know and he and Phil head off to the pub. RUTH: Why? You afraid of losing the President as well? SUSAN: No, the first thing a President needs is a sense of humour, and yours seems to be surprisingly intact. Susan says if she knew there was tension between them she never would have asked Phil in the first place. Ruth admits that they need someone with his expertise and asks Susan to track Phil down and see how he feels about staying on. The boys come back in and Phil admits to feeling better. Just one thing after another; Debbie then Helen then Ruth… Jo asks how things are between him and Debs and he admits they're not good. She works out that it's about the Coffee Shop and tells him that she's going ahead with it. Phil joins Karl at the pool table and says things are getting complicated. It doesn't matter who puts in the money – Debbie doesn't have the experience and the Coffee Shop is showing a loss. He decides that he needs to tell Jo the truth about the state of the business. He says Debbie has good ideas but experience is the key and that's what she lacks. It's Jo's decision as to whether or not she puts her money in, but she needs to know the risks. Susan's called around to see Phil and ends up telling Helen about the Wimbledon final that was played out across the road. Susan says she had no idea they disliked each other so much and Helen just smiles. HELEN: It may not be a case of them disliking each other too much. SUSAN: Well that sounds interesting. HELEN: Perhaps it's just the opposite. SUSAN: They like each other too much? Really? Susan. Such a gossip queen. Toadie is lying on the couch, watching TV. Would be a normal scene if the couch weren't now directly in front of the door. Karl walks in. Karl asks what's going on and Toadie says he was reading up on feng shui and realised the room had bad energy. He was bored, they didn't want to play cards, so they did him a favour. 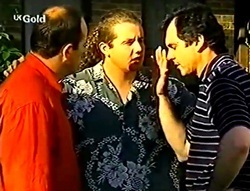 Karl's so not fooled and tells Toadie to put it all back. Now. Lance knocks on the door and tells Toadie he's found a replacement vase. It's identical to the one they broke. Susan's white vase with little flowers will be replaced by… A blue vase with little flowers. TOADIE: The colour is completely different you idiot! LANCE: Yeah, but apart from the colour it's exactly the same. You can see why Susan felt the need to keep him back a year, can't you? TOADIE: What the hell are we going to do with this? Susan reports that Phil wasn't home and is now more interested in getting information out of her friend as to her feelings for Phil. She tells Ruth that she remembered this couple she used to know who always fought and everyone thought they couldn't stand each other but in fact it was completely the opposite. RUTH: And which couple would this be? Just about any soap pairing you care to name really. Ruth dismisses it as rubbish but Susan says it would help to know what was going on. It can help, talking things through with a friend. *Such* a gossip queen! RUTH: You are too clever for your own good, Susan Kennedy. Um… but she had to have it pointed out to her. By Helen. Cheeky woman, taking credit like that! Jo bluntly tells Debbie that the deal is off and Debbie says that it's marginal but she can turn it around. Debbie realises that Phil came back and said something and storms out of the pub. 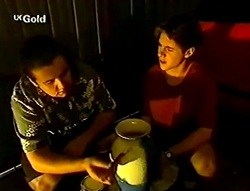 Toadie is painting the vase and Lance declares it's the wrong colour. Obviously they've now covered art in their tutoring sessions and Lance can tell white from blue. Toadie says it'll work – put it in a less obvious place, make sure the light's not as good, throw some dust on it and it'll be fine. The sound of someone on the other side of the door threatens to spring them and Toadie tells Lance to grab the still-wet vase and hide. Karl opens the garage door and asks what Toadie's doing. Toad says he's checking the paint – he's going to paint Lance's skateboard (as long as it's the right colour). Karl tells him he's not painting anything belonging to a family member and informs Toadie that if he doesn't stop behaving in this weird manner he'll have him certified. Once he's gone Lance reappears, his shirt now covered in paint. Jo's talking to Helen about the risk posed by Debbie running the Coffee Shop. Helen does agree Debbie lacks experience, but that's why she's on board. But she disagrees on the risks. She believes it's a bargain but it's up to Jo what she does with her money. Ruth and Susan are laughing about their respective love lives. Susan did something with Karl or let him do something until he proposed, apparently she had him begging and I want to know what! Ruth gets up to answer the knock at the door and is surprised to see it's Phil. Phil apologises to them both for his behaviour and excuses herself, giving Ruth a thumbs up before she leaves. Phil apologises again and Ruth apologises again. They agree to try and work together on the PTA. Toadie fiddles with the nearby light so that the vase isn't as well lit. TOADIE: I can't believe we're actually going to get away with this. LANCE: Yeah, if no one ever looks at it again. 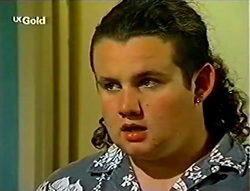 Lance heads home to change his painted shirt before Ruth sees him, and Toadie makes an equally quick exit as Karl and Susan put in an appearance. Karl remarks that one day Toadie will make an excellent case study for a PhD in psychology. Susan meanwhile is bursting with the gossip about Phil and Ruth and spills the beans to the gossip king. Debbie's a bit taken aback that Jo's changed her mind again – thanks to Helen's advice and talking it through, she's happy to invest. Phil walks in and asks what's going on. They tell Phil that Jo's investing after all and he says that if they're happy he'll go along with it. After Jo's gone Debbie rejects his congratulations, saying he stabbed her in the back. Once again, as he goes to leave, Helen calls him back. He was hardly being fair and balanced when he tried to destroy all her plans and dreams. The gossip queen has finished regaling her story of why Phil and Ruth have been acting so strangely and swears the gossip king to secrecy. Karl notices Dahl is perched on the piano, on a certain vase no less. As he gets the bird down he gets paint on his hands from the vase. 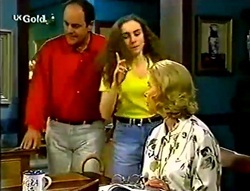 Susan quickly realises that it's not her vase and Karl calls out for Toadie. As he appears nervously at the door Karl and Susan turn to face him. KARL: We're waiting for an explanation. It'd better stun us with its brilliance.